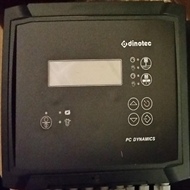 All Dinotec models featuring PPM control utilize self cleaning potentiostatic chlorine probes, and are flow-rate compensated by sophisticated software in the controller itself. This means that varying flow through the measurement cell does not destabilize the chlorine reading. 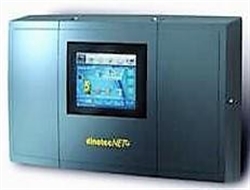 The cleaning process is also fully programmable, automatic, and electronic. No deterioration of the probe occurs through physical erosion - a feature that sets it apart from competitor units. Utilizing potentiostatic probes also eliminates the need for zero-point and sensitivity calibrations which are needed often in other amperometric chlorine probe applications. 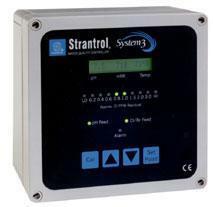 This means that these controllers are far simpler to operate and maintain than most PPM controllers. The PPM probe is also a patented design which operates under pressure - therefore an open discharge setup is not required, meaning no wasted water. Additionally, replacement probes cost only as much as standard pH and ORP probes, whereas other manufacturers probes can cost many hundreds of dollars, or over $1000 in many cases! The design is fully modular, with capacity to control up to 3 bodies of water. In fact, its possible to add control for a second or third body in literally minutes. Remote mounting of of the probe cell is also possible. 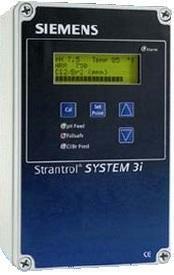 The controller itself can be mounted in a separate location from the measuring cells of all bodies of water. The color touch screen provides a wealth of information at a glance including a detailed view of a single pool, or an overview of all pools & spas being controlled. We can get whole units, parts & service for almost any brand of controller. Your controller having problems? Ask us to Help!